Absolutely love this rug. It's thick, very eell made. It lays flat right away and completes the nautical flair I was going for in my entryway. Breathe fresh style into your home with this Moroccan-style rug from Safavieh's stunning Cambridge Collection. Its trellis pattern and geometric shapes capture the traditional decorative motifs of cities in the Mediterranean, while the combination of navy blue and white creates a dreamy seaside feel. This rug adds a visual focal point to your decor, unifying spaces such as seating areas and dining rooms. This beautiful rug is very cushy, is beautiful under our dining room table, and was a great price. One surprise: the size of the design. Each medallion is about 14" in diameter. This is oK for us, because much of it is under the table, but it might be too bold a pattern in the middle of a room. I'd be happy to provide a photo that shows it in the room, if Overstock wants to add it. 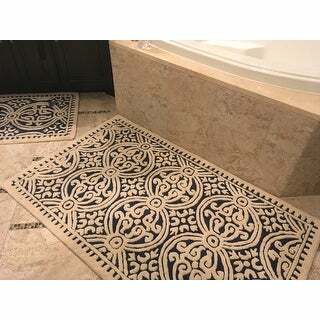 I really like this rug, it looks great and feels good underfoot. 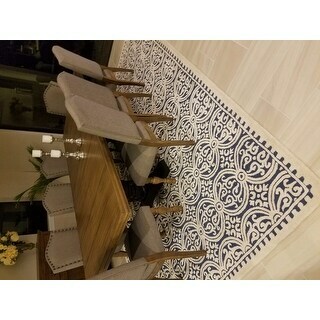 The Moroccan design goes well with both traditional and contemporary decor. Wool rugs, by their nature, will shed initially. The shedding has , however, been minimal and in line with other high quality wool rugs I own. The price I paid on overstock.com is truly wonderful for a rug of this quality, fiber, and design. The color is as pictured on website. Since I bought the 2'6" x 4' a rug pad is advisable to hold the rug in place. 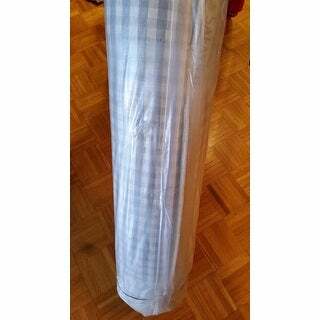 I purchased a large waffle weave pad and was able to cut it into pad for about 3 small rugs and 2 medium sized rugs. Very inexpensive that way. This handmade wool rug is an an absolute must have for anyone looking for a natural fiber rug for their home. 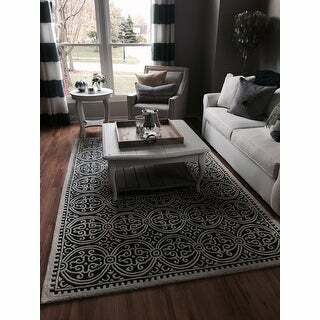 I bought the Safavieh Moroccan Handmade Cambridge navey blue rug for the living room in my new home. The colors are axsctly as depicted on Overstock.com and the wool pile is thick and luxurious! The deep navy blue pattern pops against the soft ivory background. The quality and design are amazing! I’m 100% sattified with this purchase and plan to buy the runner gor my 2nd floor hallway! I have this Safavieh Moroccan Blue Wool Rug in different sizes. I love the pattern. The quality is excellent! You can’t beat the price of this rug too. Like another reviewer said, this rug is primarily ivory, not blue. 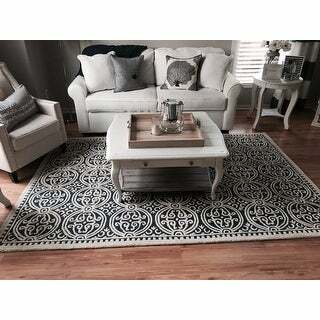 It's a beautiful rug but be prepared for ivory with blue gray accent, not navy blue with ivory accent. I had high hopes for it but mine went back. I rated it good because it's a nice rug for the price but it's not what they description says it is. The pictures are also deceptive-the ivory design is thicker and more prominent. 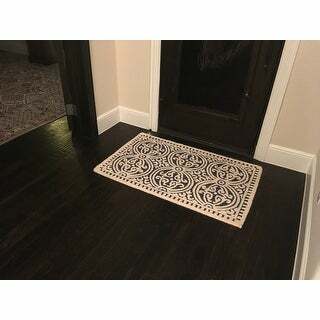 This is the second rug I've purchased recently from Overstock.com and I like it as much as the Safavieh Watercolor Rug that I bought last month for my dining room. 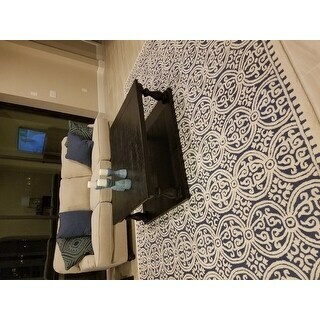 I originally ordered this rug in silver but decided that the blue would look better with the décor in that room so I sent the silver rug back. The return process was easy and the blue rug arrived a day earlier than promised! I would say that the blue in this rug is not quite navy-it's lighter, more of a pretty royal blue-and it looks great with my new blue-accented living room chair! 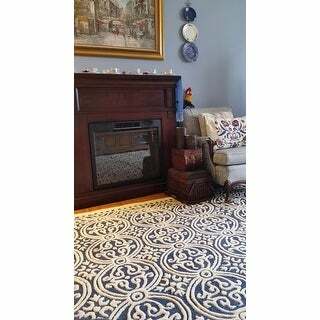 The ivory in this rug looks very pretty against the blue and this color combination adds a richness to the room that I really love. This is a quality rug with a fairly dense pile and has worn well so far. I do not notice a lot of shedding as some reviews have stated. Very pleased again with my purchase....will continue to be a loyal customer. I love this beautiful wool rug! The color and pattern adds so much to our great room! 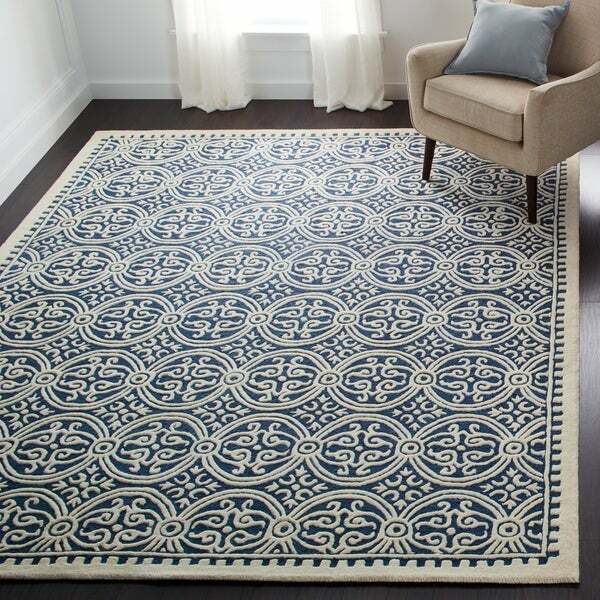 This handmade Moroccan Cambridge Navy Blue wool rug is gorgeous. Athough its decribed as a Navy blue rug, more of its cream color comes through then the navy. Safavieh has done it again! This well made, colorful rug has brought life/pulled the living room space together. The navy blue is a bright navy blue and the cream color is true. We added a pad underneath (purchased from overstock) for comfort - either way will work fine. It sheds less than other wool rugs we have owned - nice bonus! I expect to get many years out of this rug - I can see us repurposing to another room as styles and taste changes. Glad I purchased it (I had been looking at it for about 6 months). As always, the shipping time frame with overstock was expedient. I ordered two runner sized rugs, and the look of the two differed greatly from one to the other. One is clearly thicker, with much more of the white coloring, while the other is more in keeping with the picture posted on the site. Placed them both on dark hardwood, and unfortunately they shed like wet, mangy dogs! Vacuumed continuously (daily)for the first four weeks without let up. Hopefully the shedding will die down soon. Not only did I receive these before they were promised (thank you! ), I've them to be of very high quality. I ordered the 3'x5' and the 2.6'x12'. As for the issue of the blue/cream ratio, I will say that the wider the rug, the more prominent the "blue" seems to be (even though the pattern is identical between sizes) so if you are interested in the smaller sizes, it will appear to be more cream than blue. Also, the cream detail is a lot thicker/wider than represented in the picture. I am very happy with my purchase. The image on site reads primarily navy blue. However, since the ivory portions of the rug are raised above the navy, I could only really see the navy when standing on the rug. The quality is excellent; I simply want a primarily blue rug as opposed to this, which looks like an ivory rug with blue accents. I am not one to write reviews but for this one I felt like I needed to. I was ready to cancel this order after reading some of the reviews on this & I am sooooo happy I didn't! Let me say that I have worked in design & love decorating and I'm really picky. With that being said...... First off, the rug is beautiful, heavy and expensive looking. I ordered an 8x10 and it is exactly as pictured. It is navy (not a dark navy, but navy none the less). It is absolutely NOT more cream with touches of blue as some were complaining about. And the cream parts are not way higher than the navy. So if you like the rug in the picture and that's what you want, you'll love it! Absolutely love them, they look very expensive! I couldn't be happier with them! After reading so many negative reviews - I went back &amp; forth about ordering this rug. I am so happy that I did - it is exactly what I wanted to complete my living room. I ordered the 6x9 blue with ivory. It is stunning, I love it. I have had no shedding, it's just beautiful. Returning. Color is not Navy but much lighter. This rug is absolutely gorgeous! I get compliments often. It is plush, soft and, interestingly! does not shed as much as most wool rugs. I have this in my kitchen by the island to soften the space. PERFECT! Rug is beautiful, but it sheds like crazy. This is so lovely and is just as it appears in the photo. The colors just gave a pop to my living area and I am so happy I took the plunge and purchased it. Another home run from Overstock! Absolutely love this rug. Nice thick feel. Did have a slight smell when we opened it, but went away within a few days and vacuums. Shedding also stopped after a few vacuums. I would definitely recommend purchasing this rug. It is what I expected. I love the thickness of the rug and the handcrafted Moroccan look. It is beautiful! Love, love, love this rug with its thick pile, design and style. "The shedding on this rug is unbearable. Any suggestions because I'm about to throw it out?" Shedding is natural with handmade wool rugs, and can be helped with routine vacuuming. "i LOVE THE BIG RUGS TO PUT UNDER OUR DINING ROOM TABLE AND MATCHING RUNNERS CAN YOU USE A SWEEPER ON THESE AREA RUGS"
Yes a sweeper?, No problem. I have three of these beautiful rugs accenting my DR table , LR table and bed floor . They get the sweeper, the vacuum, broom swept,scrubbed weekly at least twice and have proven to be durable high quality rugs over and over again. Also, they must be treated with a scotch guard (type/like)(I'm sure it states info somewhere) product because the rugs are very stain resistant. 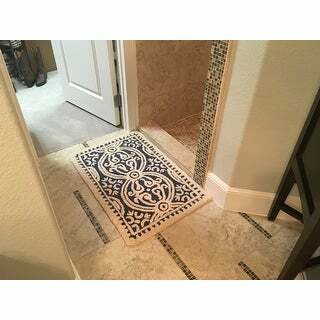 They are great high quality rugs. Regular vacuuming is the best way to clean these rugs, but excessive vacuuming is advised against. "Is the wool scratchy? Can you sit on the floor without it really shedding/causing rug burn?" It is not scratchy at all. It’s soft but thick. Very well made am I am picky. "What size rug is available "
You can select the size you would like in the option drop down box. "I bought a 4X 6 rug. I got it today and it’s 8x 10. Do you have the 4x6?" No I have the 5x8 and I LOVE IT!!!!! We do have the 4 x 6 in stock. "Love this rug but it smells like really strong. Has anyone has the same problem?" No odor issue on my end. No smell for me. It did shed for a few vacuuming cycles but we love it and get lots of compliments. We've had a big problem with the smell. We've had it for over 5 months now and it still smells at times. It was really bad for a few months but it is getting better. I find it worst when the door is closed and the humidifier is on. We open the doors, windows and use a odor neutralize to help. We couldn't figure out what it was for the longest time but then realized it couldn't be anything other than the rug. It's been frustrating but we kept the rug because we love it. "What can I put under this rug to keep it in Place? Something for the corners?" 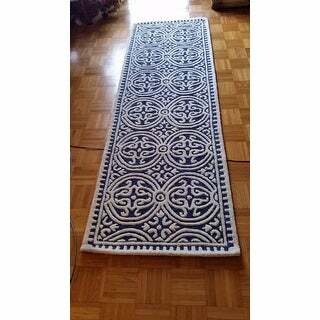 Safavieh Handmade Moroccan Cambridge Navy Blue/ Ivory Wool Rug - 7'-6" X 9'-6"